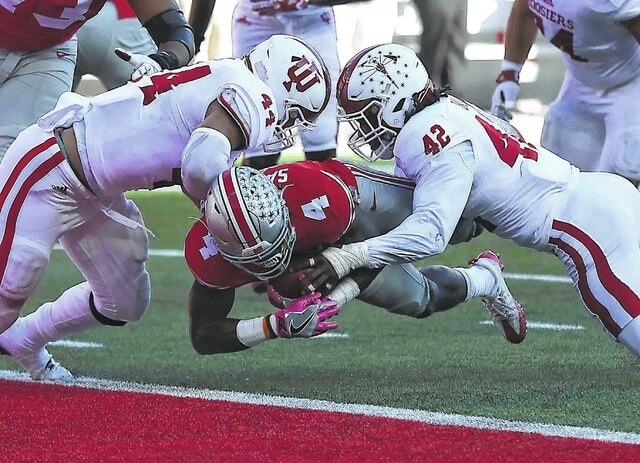 The first of those came on a much-questioned call, upheld by replay, that gave OSU the ball at Indiana’s nine-yard line on a fumble by quarterback Richard Lagow. Two plays later, Weber scored on a 9-yard run for 17-3 lead with 3:32 left in the first half. Ohio State’s Paris Campbell leaps over Indiana’s T.J. Simmons during Saturday’s game at Ohio Stadium in Columbus. http://aimmedianetwork.com/wp-content/uploads/sites/38/2016/10/web1_Ohio-State-vs-Indiana-DS1.jpgOhio State’s Paris Campbell leaps over Indiana’s T.J. Simmons during Saturday’s game at Ohio Stadium in Columbus. Ohio State’s J.T. Barrett avoids the tackle attempt of Indiana’s Marcus Oliver during Saturday’s game at Ohio Stadium in Columbus. http://aimmedianetwork.com/wp-content/uploads/sites/38/2016/10/web1_Ohio-State-vs-Indiana-DS14.jpgOhio State’s J.T. Barrett avoids the tackle attempt of Indiana’s Marcus Oliver during Saturday’s game at Ohio Stadium in Columbus. Indiana’s Tyler Green (3) breaks up a pass intended for Ohio State’s Paris Campbell during Saturday’s game at Ohio Stadium in Columbus. http://aimmedianetwork.com/wp-content/uploads/sites/38/2016/10/web1_Ohio-State-vs-Indiana-DS7.jpgIndiana’s Tyler Green (3) breaks up a pass intended for Ohio State’s Paris Campbell during Saturday’s game at Ohio Stadium in Columbus. Ohio State’s Curtis Samuel gets low to score a touchdown against Indiana’s Marcus Oliver, left, and Marcelino Ball during Saturday’s game at Ohio Stadium in Columbus. See more game photos at LimaScores.com. http://aimmedianetwork.com/wp-content/uploads/sites/38/2016/10/web1_Ohio-State-vs-Indiana-DS9.jpgOhio State’s Curtis Samuel gets low to score a touchdown against Indiana’s Marcus Oliver, left, and Marcelino Ball during Saturday’s game at Ohio Stadium in Columbus. See more game photos at LimaScores.com.